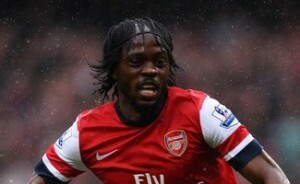 It has been reported that Arsenal are ready to sell Gervinho. Marseille are keen to take Gervinho back to France this summer. But the Daily Star Sunday claims that the Ivory Coast international is closing in on a £12million switch from Arsenal to Galatasaray. The Turkish giants are ready to make a bid for the 26 old so they can team him up with compatriots Didier Drogba and Emmanuel Eboue. Gunners boss Arsene Wenger is ready to cut his losses with Gervinho, who has been a big disappointment since he signed for £10.8m from Lille in 2011.